MR. McDERMOTT: If you’ve seen the media coverage from over the evening, the most significant development is shown pretty vividly on some of the video. There was, at the Unit 1 reactor, an explosion of some time, that took off the core (inaudible) metal siding on the refueling floor level. There is speculation that perhaps, it was some type of hydrogen detonation, although we do not have any confirmation for this, at this point. Yesterday, Unit 2 was — they kind of went back and forth between which unit was having more trouble. 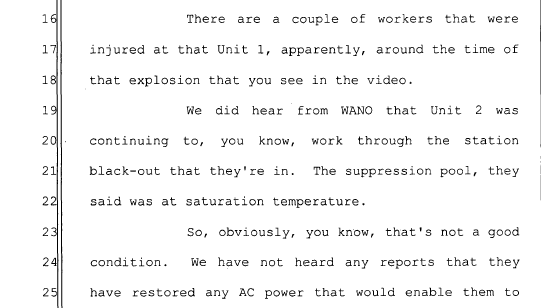 There are a couple of workers that were injured at that Unit 1, apparently, around the time of that explosion that you see in the video. We did hear from WANO that Unit 2 was continuing to, you know, work through the station black-out that they’re in. The suppression pool, they said was at saturation temperature.